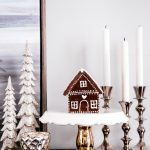 This DIY Cinnamon Salt Dough Gingerbread House will make your home smell amazing & is a beautiful keepsake that you can decorate your house with year after year. In a medium bowl mix 1 cup of flour, 1/2 cup of salt, & 3/4 cup cinnamon. Knead for 15-30 seconds to create a workable dough. Next, roll out your dough & use your gingerbread house cookie cutters to create the shapes for your house. Carefully place the dough on a baking sheet lined with parchment paper. Once thoroughly dried/baked, remove it from the oven & let cool. Paint your house & let the paint dry. I used white acrylic paint & an icing tip in a plastic bag to decorate my gingerbread house. To speed up the drying process I popped my painted gingerbread pieces back in the oven at 200ºF for about 15-20 minutes. Assemble your Cinnamon Salt Dough Gingerbread House using E6000 glue to hold the pieces together. Add a little more paint on top if desired. That’s it! Happy Christmas decorating! Be sure to only add a little water at a time so that your cinnamon salt dough does not become sticky. If it does, simply add a little flour. Don’t be alarmed after the first hour when the cinnamon salt dough appears lighter in color, that is just the salt being pulled to the top from the heat. You will be decorating the bottom/darker side of the cinnamon salt dough.